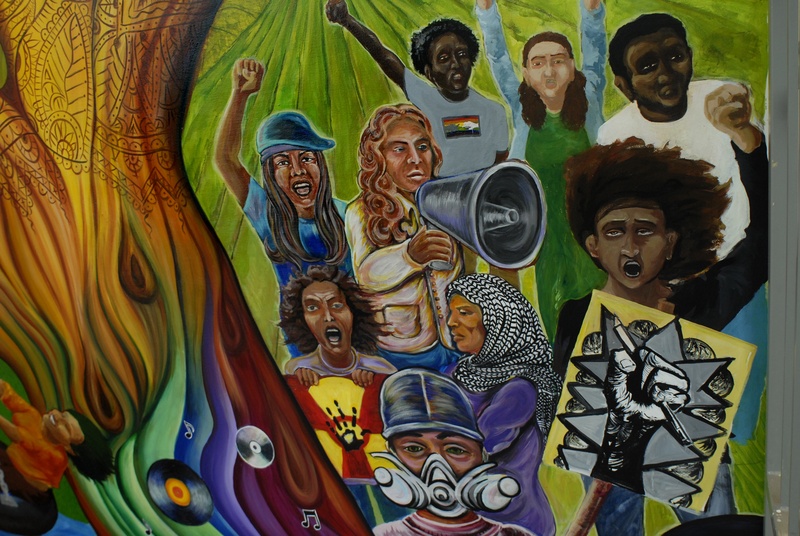 Saturday, June 4th, the True Colors Mural Project unveiled its newest mural, entitled Collective Consciousness, in the new green building of the YMCA-PG&E Center in Berkeley, CA. 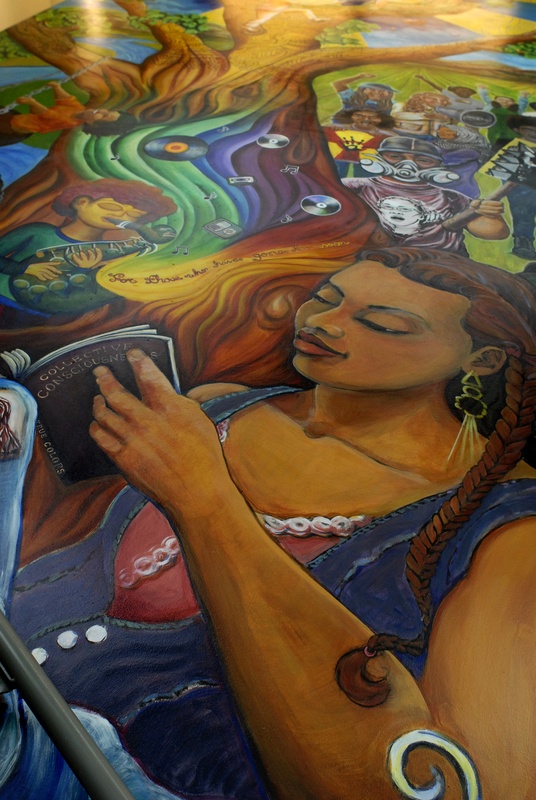 This three-story mural, illuminated on the interior stairway facing Martin Luther King Jr. Way, is one of the largest murals in the city of Berkeley. The morning rain did not dampen the brightness of the festivities during this entire day of celebration. 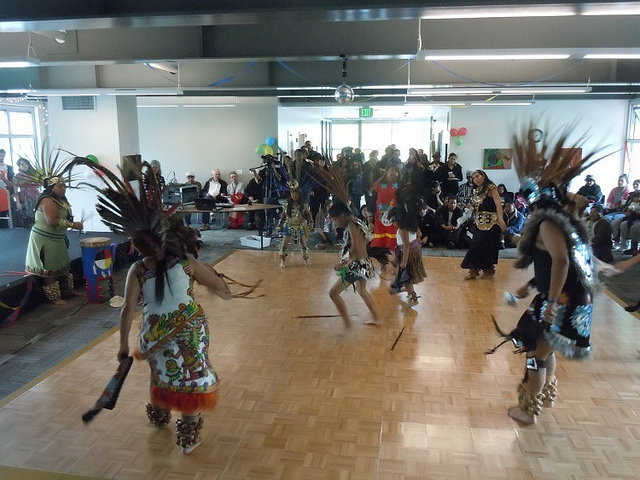 The Cuahtli Mitotiani Danza Azteca group opened the event with their bright colors trajes. They danced to bless and celebrate the accomplishments of the students in this project. Two of True Colors Mural Project students, Diego Mendoza Cordero and Amalia Gaspar, drummed and danced with the group in celebration of the unveiling. Mayor Tom Bates also came and paid his respects at the unveiling, showing his appreciation for the work that the students have completed. 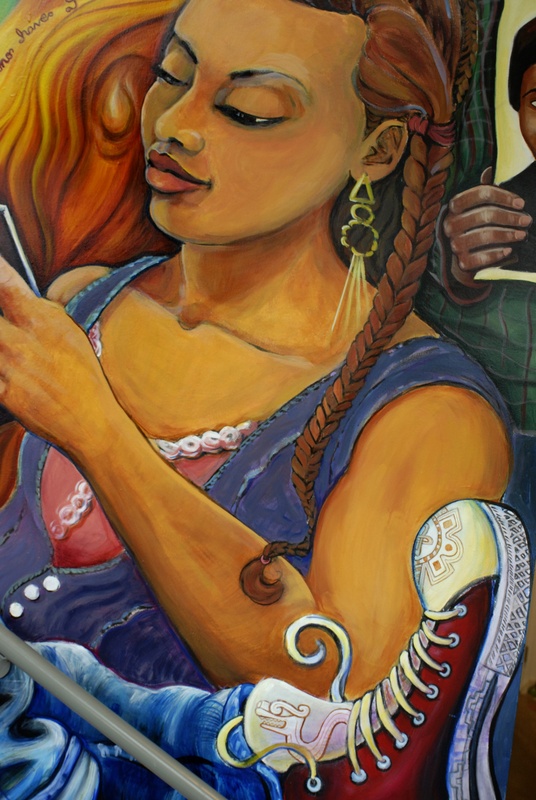 The youth of YMCA-PG&E center, along with the students of the True Colors project, talked about their experience of collaboration and how this mural impacted their own personal transformation. 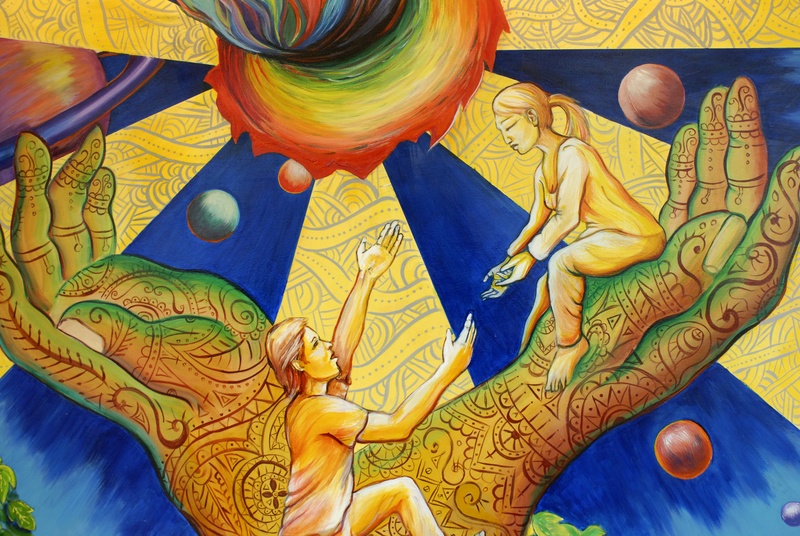 The Collective Consciousness mural not only serves as a public art installation for the general public to witness, but also a symbol of a transformative accomplishment for those who participated in the creative process itself. The event also featured students’ art exhibition throughout the entire building and the stairwell. 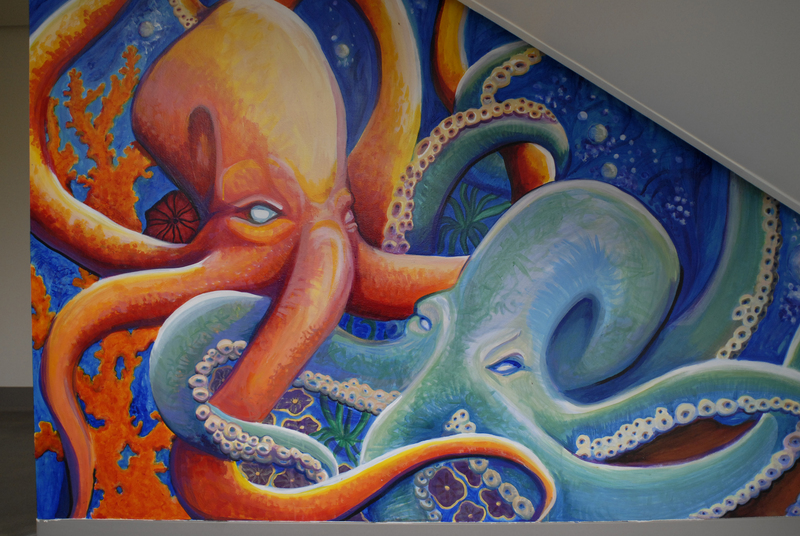 The space was filled with in-progress designs and illustrations, telling the story of how this mural was created. Student muralists also provided mural tours every half an hour in order to give families and friends a more intimate explanation of what was depicted in the wall. Community members of all ages and backgrounds came and celebrated. The lobby of the Teen Center was filled with postcards, shirts, and children’s coloring books mixed with balloons and streamers, for all to see and enjoy. DJ Skrypt filled the building with his tunes as the audience swayed on the dance floor. 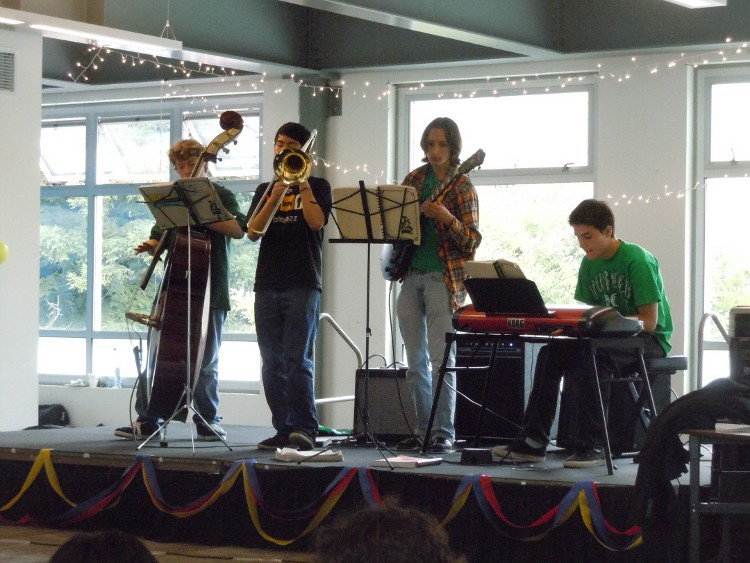 Spoken word and poetry were sprinkled throughout the event, and the Berkeley High School Jazz Ensemble played their melodic rhythms to embrace all that came. 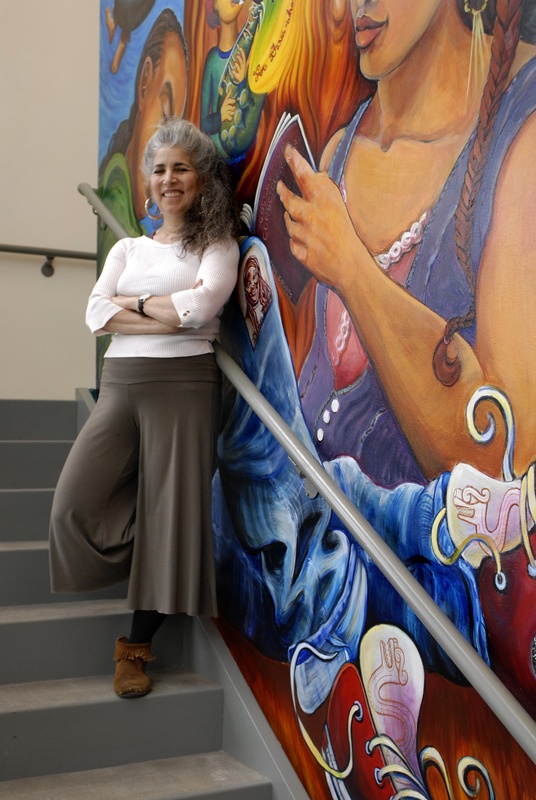 Juana Alicia, Director of True Colors Mural Project, shined brightly as the students acknowledged her leadership as a fierce and humble artist and educator. 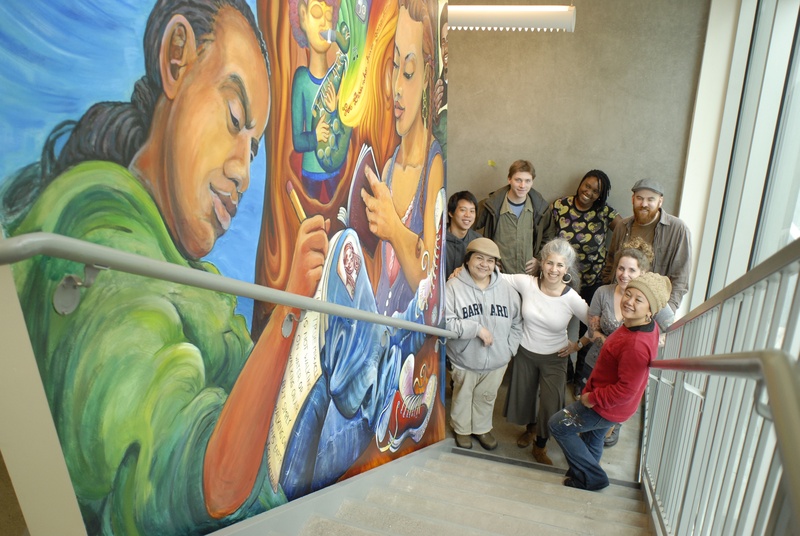 Collaborators with Earth Island Institute and Berkeley City College came and shared the celebration of the completed mural. At the end of the day, the rain stopped and the sun was shining. 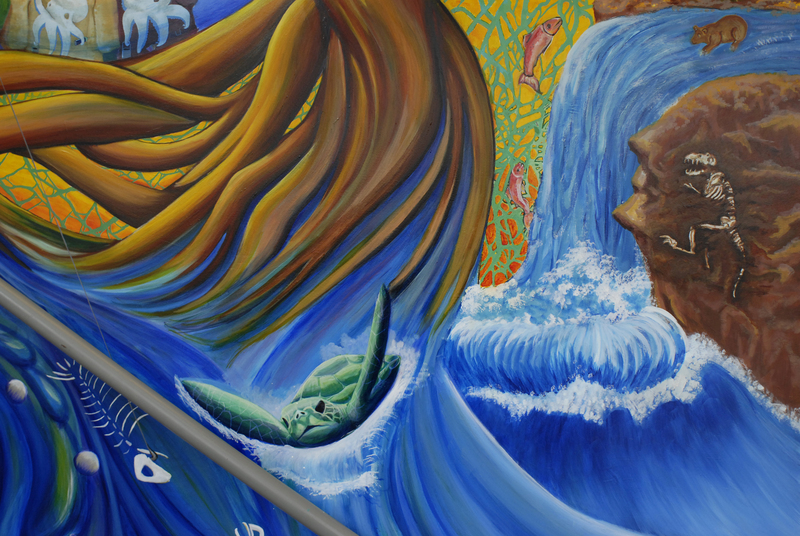 This class creates environmentally conscious murals for the community. This is the first semester in a two-part class. 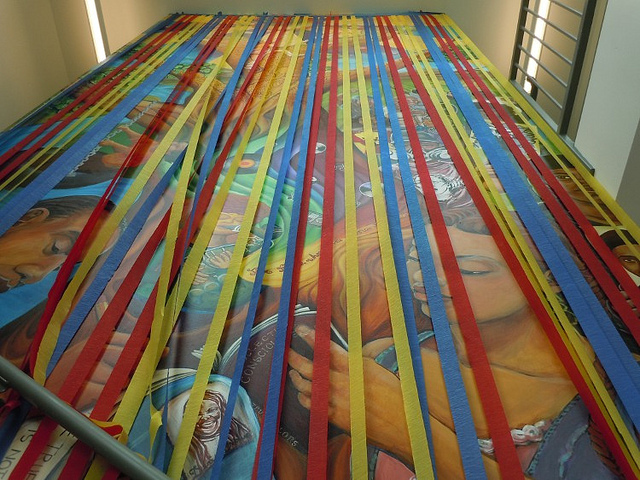 During the first semester, students research and design a community mural. 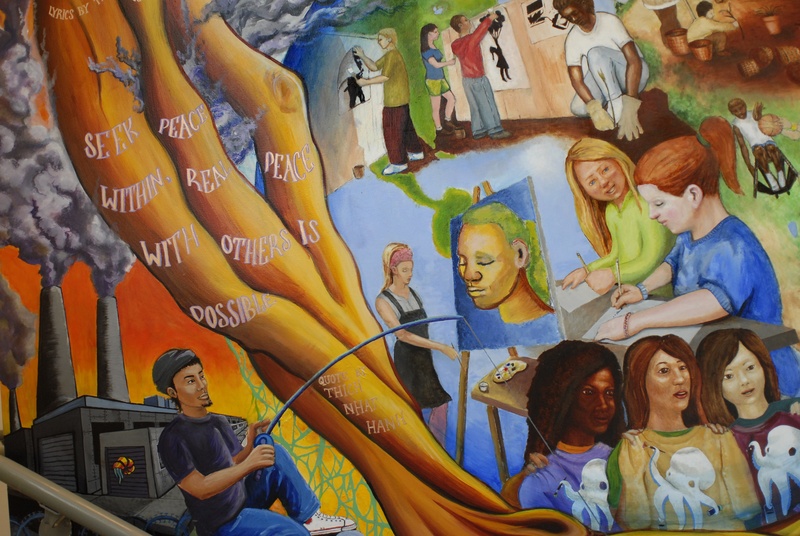 In the spring, students create the mural. If you paint, community organize, write, do graff, photography, web design or blogging, this could be the class and project for you! 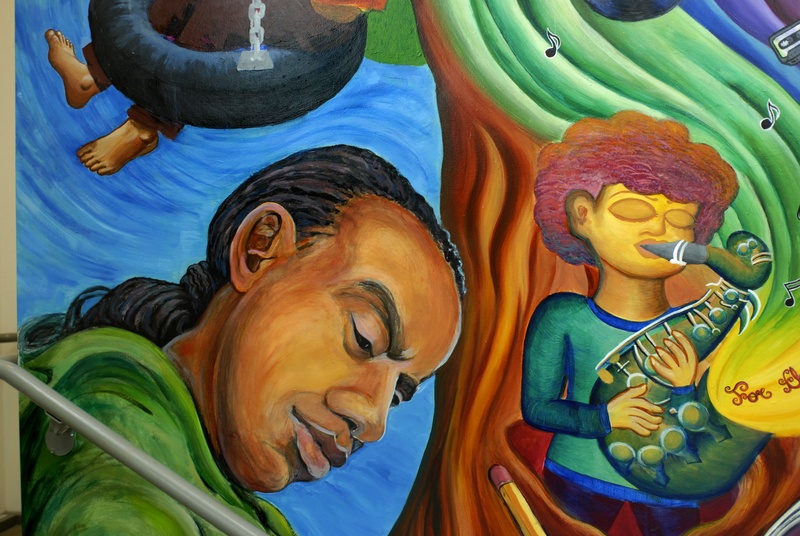 True Colors has created six public murals in Berkeley to date, the most recent being the mural for the new YMCA Teen Center, located at the corner of Martin Luther King Jr. and Center Streets. The center, which is receiving financial support from PG&E, was designed with the help of a task force of teenagers. 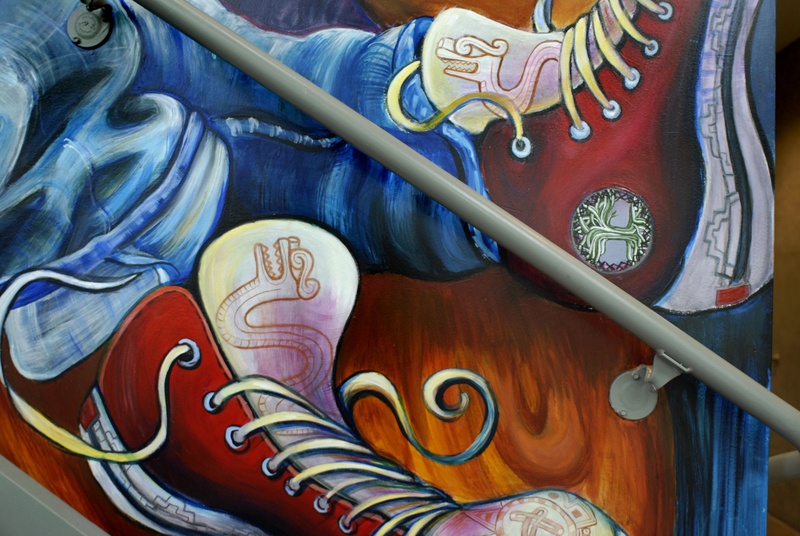 The True Colors team of muralists worked closely with the teen leadership group, AMP, to create a design for the three-story, illuminated interior stairway that faces Martin Luther King Jr. Way. Painting began in February, and the mural was completed by late May. The Teen Center aims to provide the city’s 2,500 teens with help in the areas of academic achievement, employment, leadership development, environmental training and career planning. PG&E donated the 8,000 sq. ft former service center that, once renovated, will become the LEED-certified center.